Apple Cider and Donuts go together for me. I have wonderful memories of fall trips to apple farms, celebrated by warm cider and fresh-from-the-fryer cinnamon donuts. I’m not sure if this combo is as popular in warmer states as it is here in apple-growing Michigan country, but it is a flavor that I crave when the weather turns cooler. And then there is caramel. The sweet, sugary perfection that has long paired with apples on sticks, apples for dipping, apple pies, and sour apple suckers. If caramel goes with apples, and apple cider goes with donuts… why wouldn’t they all go together? Because, my friends, they are dangerous. Delicious. Easy. Fresh. Perfect. And I-ate-a-whole-dozen-before-the-rest-were-fried kind of dangerous. Combine 2 cups flour sugar, salt, nutmeg and dry yeast, in the bowl of your mixer. Turn mixer on low/mix. Add egg yolks and then butter and milk. Once combined, begin adding remaining flour until mixture forms a dough and pulls away from the sides of the mixer. Transfer dough to floured work surface and knead for 5 minutes. Cover and let rest for 10-15 minutes. 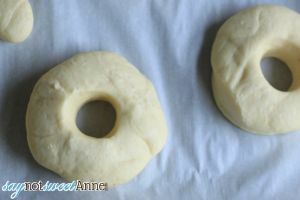 Roll out dough until about 1/2 inch thick. 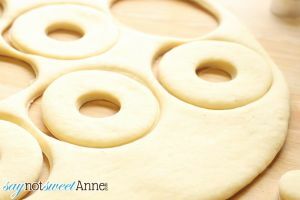 Cut donut shapes (large 3-4in circle for outside, 1-1 1/2 inch circle for holes). Gather and reroll excess dough. 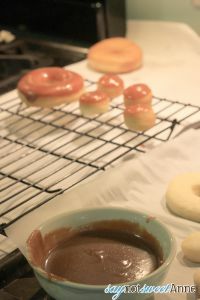 Move donuts to surface 2 inches apart and cover loosely in a warm but not hot place. Let rise for 40 – 60 minutes. Fry risen donuts in 350° oil (I used corn oil. And you must use a thermometer for the oil. Temp is very important!) for 2-3 minutes on each side or until golden brown. Transfer to paper towel or newspaper to remove excess oil. Heat 1/4 cup of Apple Cider Caramel Sauce in microwave for 10 seconds until loose. Dip donuts in sauce and let drip on a wire rack until cool. That’s it folks! 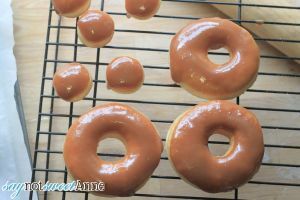 These donuts were so amazing, I can’t wait to make them again. Each year hubby and I make new traditions for our growing family. I can totally see Caramel Apple Cider Donuts being an after-apple-orchard favorite!! 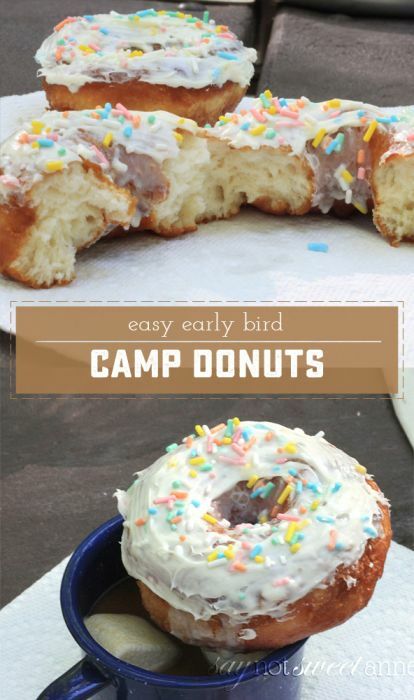 Oh, and if you’re into donuts – checkout these Early Bird Camp Donuts! They’re just as yummy at home, and aren’t quite as involved as these scratch-made kind. 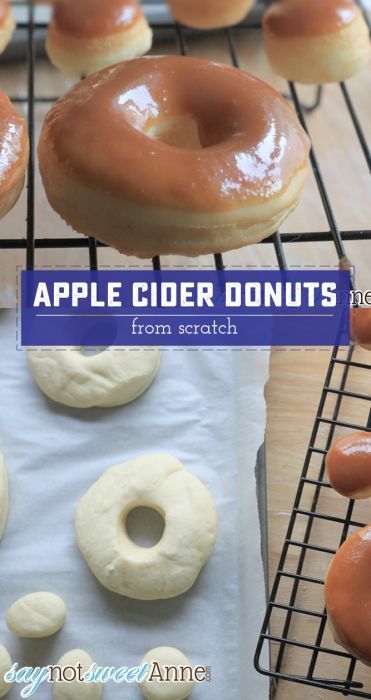 These donuts look amazing, especially with that apple cider caramel! I’m glad you like them Marcie! I encourage you to try them!! Oh yum! You know, I’ve never tried making my own donuts – but it looks like I should get cooking. I bet these are amazing! Oh Dawn, they are! And pretty easy as far as bread-based products go! These are adorable and that Apple Cider Caramel Sauce sounds divine!